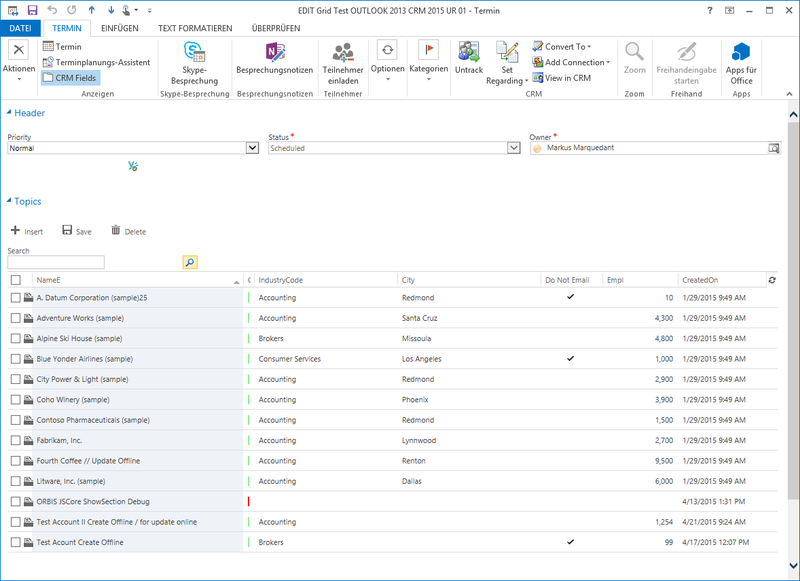 Now with Microsoft Dynamics CRM Version 2015 UR 0.1 it is not only possible to show all CRM fields in an Outlook appointment, task or email rather it is now possible to show HTML web resources. This gives us new opportunities to map business processes. For example, users can now enrich the Outlook appointment directly with additional data and this without jumping into the CRM. Just an example, which shows an editable grid into an appointment form. Now the user has the possibility for an easily editing, creating or deleting of data. Double click the selected appointment and you will see the ‘CRM Fields’ button. Just click it. If this message appears, you have to track the appointment into CRM. This is one of the best new features in CRM for me. I’m struggling on what’s possible or not with CRM attributes displayed in the tab “CRM Fields” of an Outlook appointment. Some jscript code work fine, other do nothing without any error (for instance, a “Xrm.Page.data.save()” instruction doesn’t save anything). In this post, you wrote that CRM fields are “editable”. At this stage of my investigations, CRM attributes are displayed and ‘seems’ editable but are never saved (neither in Outlook nor in CRM). Do you have any other experience ? 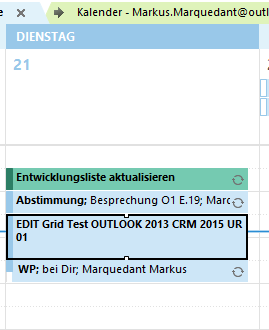 I’m working with CRM 2015 on premise (7.0.1.129), the latest Outlook plugin and Outlook 2013.